The preschooler’s more complex understanding of self, of others, and of how things work influences his/her thinking and his/her social interactions. 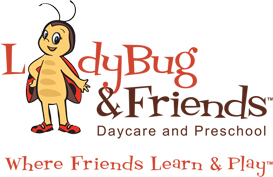 Assertiveness, initiative, and the formation of friendships characterize the preschool years. At LFDP, we understand the importance of providing optimal support and guidance to foster each child’s new capabilities and to promote his/her further growth and development. Learning new concepts, making connections, and building understanding are the focus of our group times. The book reading and educational videos, together with the discussions that accompany them, are designed to promote reasoning, questioning, and the exploration of interesting and meaningful ideas. Each child also develops his/her language and listening skills through poetry, storytelling, songs, and show-and-tell activities. Mia’s favorite show-and-tell item is her mystery box! Thinking, inquiring, and experimenting are all achieved through our science, nature, manipulatives, and games activities. The hands-on and open-ended science and nature activities provided by our teachers engage each child in exploration and learning about the world around him/her. The scientific approach of trial and error interprets error as valuable information and encourages each child to question and experiment without the fear of failure. Manipulatives and games, which require reasoning, logic, planning, and communication, stimulate each child’s intellectual development and social skills. Mia is a big supporter of fair play! The underlying idea behind all our art activities is that the process, rather than the product, is most important. Our teachers and Mia encourage each child to use his/her imagination and creativity to express his/her thoughts and ideas through activities such as painting, drawing, clay modeling, making collages, and cutting and pasting. These activities also represent opportunities for a child to learn new concepts, to develop his/her concentration abilities, and to practice his/her fine motor skills necessary for writing. Mia brings her own ideas and shares them with her friends! ‘Pretend play is story in action!’ Pretend play and fantasy flourish during the preschool years and each child’s voluntary participation in play sustains his/her involvement and enhances the activity’s benefits. The symbolic function of pretend play is a major step in the development of abstract thinking. Planning, flexibility in thinking, problem solving, self-control, collaboration, language, and attention are other skills which a child develops through pretend play and are critical to school learning. The roles our teachers and Mia take on during the children’s dramatic play, whether as a materials provider, an observer, a participant, or a supporter, contribute to the complexity of the play and to the children’s learning. Children learn numeracy through our daily activities and from our classroom environment. Guided by our teachers and Mia, our learning activities promote mathematical skills, such as counting, identifying patterns, symmetry, geometry, and measurement, as well as basic physics concepts about balance, inclined surfaces, and weight. Block play is an activity which provides learning experiences that support all areas of a child’s development. Flexible and adaptable, blocks offer an almost infinite variety of expressive opportunity from floor patterns and designs to vertical buildings and representations. Playing with blocks also offers each child opportunities for problem solving, perspective taking, reasoning, self-expression, communication, and collaboration. Literacy is everywhere! Our developmentally appropriate experiences and activities, such as book reading, singing, art activities, games, dramatic play, and journaling represent meaningful learning opportunities which incorporate early literacy concepts and handwriting in various forms. These activities foster your child’s print and phonological awareness, vocabulary, alphabet letters knowledge, narrative skills and handwriting. Additionally, the Get Set For School Program (Handwriting Without Tears) combines unique teaching strategies and hands-on manipulatives to build your child’s fine and gross motor skills. The lessons include body awareness, crayon grip, drawing, left and right, letter and number recognition, and capital letter and number formation. Movement time includes exciting and challenging physical activities. Running, jumping, climbing, and riding a bike boost each child’s eagerness for exploration and the development of new skills. Encouraged and guided by our teachers and Mia, each child progresses from beginner to advanced, mastering the skills at his/her own pace. By playing actively indoors and outdoors, each child develops muscle strength, endurance, agility, coordination, balance, and flexibility, as well as builds confidence and social skills. At LFDP, we are aware of the current public policy demands for school readiness and, therefore, strive to prepare each child for formal school learning and academic performance. School readiness does not mean only literacy and numeracy knowledge, but also includes a set of emotional, social, physical, and cognitive skills. Self-control, cooperation, listening, following rules, concentration, reasoning, and problem solving are a few examples of skills which children need in order to learn and function successfully in school. The learning activities and experiences incorporated into our curriculum are designed to address and support an array of skills which each child needs for later academic performance. In an effort to contribute to each child’s school readiness, we also design specific learning activities which resemble the learning experiences that the child will encounter during his/her kindergarten and first school years. These activities are implemented in a manner which maintains the benefits of learning through play in order to help build the bridge between playful learning and formal school teaching and to prepare each child for later academic performance.